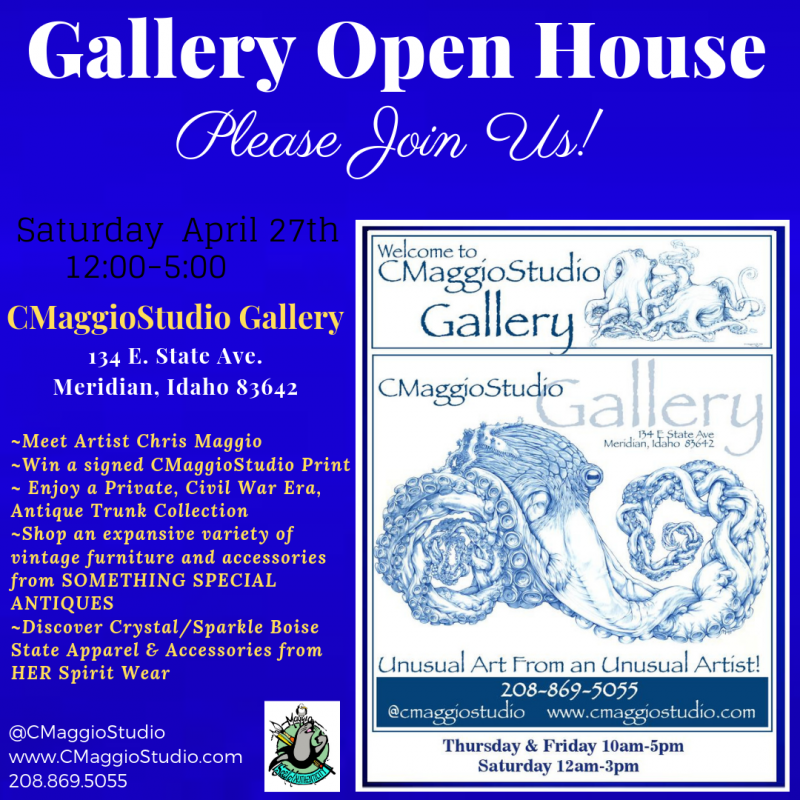 Join us to celebrate the Grand Opening of CMaggioStudio Gallery in Meridian, Idaho! As a classically trained Medical Illustrator with over 40 years of professional expression, Maggio's work is often tight and precise, so when he relaxes & draws for himself he usually escapes to the sea, to warm sandy beaches & the creatures of the coast. View Artist Chris Maggio's extraordinary Collections, learn about his World Travels, Scuba Diving Adventures and what motivates him to create such unique creatures of the sea! Signed and Limited Edition Giclee Quality prints available at the gallery. Great opportunity to have Chris sign and personalize your prints. * Win a signed Chris Maggio Print. * Enjoy a Private Collection, of Civil War Era, Antique Trunks from The Trunk Stop. * "Trunk Talk"- with Jann Maggio. Trunk restoration tips and how to blend Antique Trunks in to your interior decor! * Discover crystal/sparkle logo Boise State Women's Apparel and Accessories from HER Spirit Wear. WHOLESALE To Trade Program available. 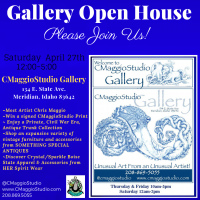 We hope you can join us for a fun day of Art and Design!